Merri Travels on Endurance.net: Raven II Drives Germany! 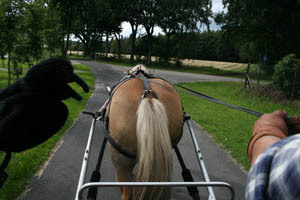 Well this was a first – a first for the Raven horsing around in Germany, and a first time driving a carriage! Jeanne had taken the day off to take me sightseeing; we went to the Het Loo Museum, the former palace of the Netherlands Royal Family, and then to eat a traditional Dutch meal: pancakes! These pancakes are made with egg and milk and flour, and are stuffed with whatever you want: meat, fruit, shrimp, garlic, just about anything. I ordered one with bacon in it... and wondered why he brought me bowls powdered sugar and thick maple syrup to pour on it, as you'd think that would go with the sweet pancakes. No, powdered sugar and maple syrup goes with kind of any pancake! Yum! Charles came home from work early, and in the late afternoon we got Jeanne's Haflinger pony Storm ready to go out for a carriage ride! For Storm, after dressage and jumping competitions came endurance competition, but before all of that came pulling a carriage – he was broke to that before he was broke to ride. 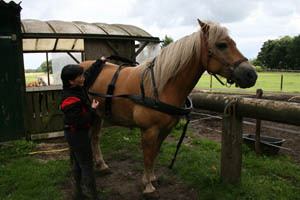 He's built for pulling a carriage – big and stout – like a miniature Belgian draft horse. 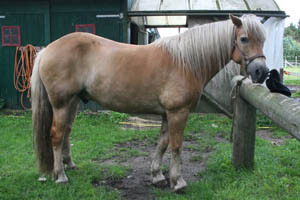 Jeanne did 5 years of endurance on him, “but he was really too big for endurance.” Looking at him from the front, you can see exactly what she means – he's very broad and heavy boned. But he handled everything that he did well, and he still pulls a mean carriage! 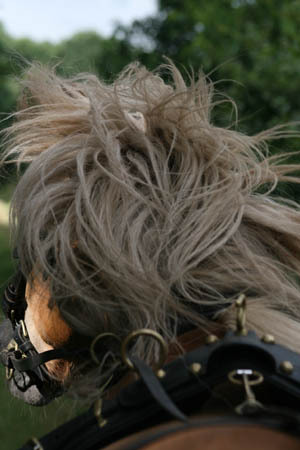 Charles rolled out the carriage, which hadn't been used in a year (“we used to go for a drive every Sunday, but now – no time!”) and dusted and sprayed it clean, and Jeanne brushed Storm (while the Raven watched) and got out his harness. When he was all dressed out, Charles drove him to the waiting carriage, and backed him up, and Charles and Jeanne attached the carriage arms to his harness and fastened the buckles. It brought back my memories of the Percheron Slim and the carriage I drove a few Christmases ago in downtown Seattle! Once hitched up, we all piled in the cart and went out for a drive in the German countryside and Dutch sunshine. It's a farming community, so the roads are narrow and the traffic almost non-existent. Some of the roads are paved with hand-laid brick, and one of them leads to the little restored old village of Itterbeck. We walked and trotted along these roads, passing a few people, some cows, and a couple of other Haflingers who looked like they wanted to run along with us. Storm motored right along, and seemed quite happy to be out for a spin. It was a lovely cool sunny day and we met little traffic. Something a little different than endurance riding today, and another great way to relax and see and appreciate the countryside!